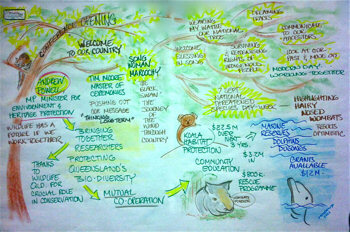 Wildlife Queensland’s 50th anniversary conference, Talking Wildlife, featured a stellar array of speakers and attracted more than 200 attendees. The two exhilirating days of ideas and information are well worth remembering, sharing and building on. To help keep the energy of the conference alive, we invited talented graphic facilitator Jana Lyn-Holly ofMindesign. She created visual summaries of each presentation, which we have posted here. For those of you who attended the conference — the poster-sized visuals Jana was drawing in real time at the back of the conference venue are now available online. Many of you may have spoken to her and recorded the drawings yourself. For those who were unable to attend, we hope these representations help extend the conference experience by giving you a good idea of what was covered and that they help keep our discussions active and our actions informed as we continue our conservation work for many more years. View the visual summaries online or download in pdf format (3.5mb). Higher resolution versions of these visuals are available on request.